Provides functions that process items in various ways. Definition at line 31 of file item.c. Definition at line 410 of file item.c. References item_struct::env, item_struct::inv, item_struct::next, and item_struct::prev. Definition at line 246 of file item.c. References new_item(), item_struct::next, and item_struct::prev. Definition at line 716 of file item.c. References item_struct::anim_speed, item_struct::anim_state, item_struct::animation_id, animations, Player_Struct::below, Player_Struct::container, cpl, item_struct::face, Animations::faces, item_struct::inv, item_struct::inv_updated, item_struct::last_anim, item_struct::next, and Animations::num_animations. Definition at line 782 of file item.c. Definition at line 435 of file item.c. References add_item(), alloc_items(), free_items, item_struct::locked, item_struct::next, NROF_ITEMS, item_struct::prev, and item_struct::tag. Definition at line 264 of file item.c. References free_all_items(), item_struct::inv, and item_struct::next. Definition at line 511 of file item.c. References item_struct::applied, item_struct::apply_type, item_struct::blessed, item_struct::cursed, item_struct::damned, F_APPLIED, F_BLESSED, F_CURSED, F_DAMNED, F_LOCKED, F_MAGIC, F_OPEN, F_UNPAID, item_struct::flagsval, item_struct::locked, item_struct::magical, item_struct::open, set_flag_string(), item_struct::unpaid, and item_struct::was_open. Referenced by set_item_values(), and update_item(). Definition at line 190 of file item.c. Definition at line 42 of file item.c. References item_types, LOG(), LOG_WARNING, and NUM_ITEM_TYPES. Definition at line 787 of file item.c. References csocket, ClientSocket::fd, MAX_BUF, script_monitor_str(), SockList_AddChar(), SockList_AddInt(), SockList_AddString(), SockList_Init(), SockList_Send(), item_struct::tag, and Spell_struct::tag. Definition at line 72 of file item.c. References item_struct::env, item_struct::inv, item_struct::inv_updated, item_struct::next, and item_struct::prev. Definition at line 300 of file item.c. References Player_Struct::container, cpl, item_struct::inv, locate_item_from_item(), map, and item_struct::tag. Referenced by common_item_command(), DeleteInventory(), DeleteItem(), hide_main_client(), update_item(), and UpdateItemCmd(). Definition at line 281 of file item.c. References item_struct::inv, item_struct::next, and item_struct::tag. Definition at line 637 of file item.c. References map, new_item(), and item_struct::weight. Definition at line 213 of file item.c. References item_struct::anim_state, item_struct::animation_id, item_struct::applied, item_struct::blessed, copy_name, item_struct::cursed, item_struct::d_name, item_struct::damned, item_struct::env, item_struct::face, item_struct::flagsval, item_struct::inv, item_struct::inv_updated, item_struct::last_anim, item_struct::locked, item_struct::magical, item_struct::next, NO_ITEM_TYPE, item_struct::nrof, item_struct::open, item_struct::p_name, item_struct::prev, item_struct::s_name, item_struct::tag, item_struct::type, item_struct::unpaid, and item_struct::weight. 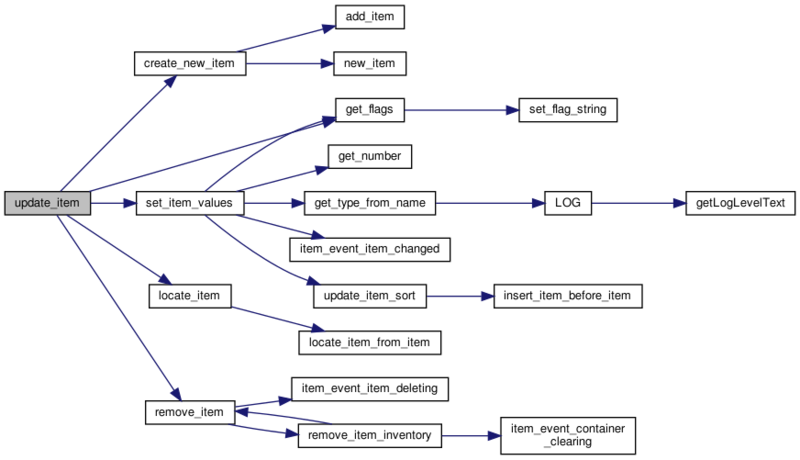 Referenced by alloc_items(), map_item(), and player_item(). Definition at line 458 of file item.c. Definition at line 631 of file item.c. Definition at line 682 of file item.c. References item_struct::d_name, draw_ext_info(), item_struct::flags, get_info_width(), item_struct::inv, MAX_BUF, MSG_TYPE_CLIENT, MSG_TYPE_CLIENT_DEBUG, NDI_BLACK, item_struct::next, item_struct::nrof, print_inventory(), item_struct::tag, and item_struct::weight. Referenced by do_inv(), and print_inventory(). Definition at line 331 of file item.c. References item_struct::anim_state, item_struct::animation_id, item_struct::applied, item_struct::blessed, Player_Struct::container, copy_name, cpl, item_struct::cursed, item_struct::d_name, item_struct::damned, item_struct::env, item_struct::face, item_struct::flagsval, free_items, item_struct::inv, item_struct::inv_updated, item_event_item_deleting(), item_struct::last_anim, item_struct::locked, item_struct::magical, item_struct::next, NO_ITEM_TYPE, item_struct::nrof, item_struct::open, item_struct::p_name, item_struct::prev, remove_item_inventory(), item_struct::s_name, item_struct::tag, item_struct::type, item_struct::unpaid, and item_struct::weight. Referenced by DeleteItem(), remove_item_inventory(), and update_item(). Definition at line 393 of file item.c. References item_struct::inv, item_struct::inv_updated, item_event_container_clearing(), and remove_item(). 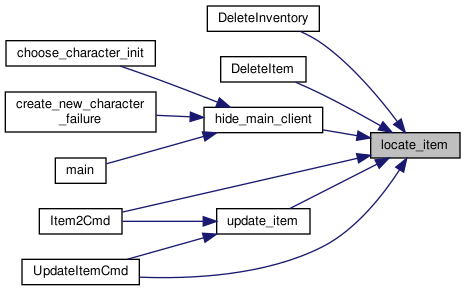 Referenced by DeleteInventory(), hide_main_client(), and remove_item(). Definition at line 614 of file item.c. References csocket, item_struct::env, ClientSocket::fd, MAX_BUF, script_monitor_str(), SockList_AddInt(), SockList_AddString(), SockList_Init(), SockList_Send(), and item_struct::tag. Definition at line 477 of file item.c. References apply_string, item_struct::apply_type, item_struct::blessed, item_struct::cursed, item_struct::damned, item_struct::flags, item_struct::locked, item_struct::magical, item_struct::open, and item_struct::unpaid. Definition at line 527 of file item.c. References item_struct::anim_speed, item_struct::animation_id, copy_name, csocket, item_struct::d_name, item_struct::env, item_struct::face, get_flags(), get_number(), get_type_from_name(), item_struct::inv_updated, item_event_item_changed(), NO_ITEM_TYPE, item_struct::nrof, item_struct::p_name, item_struct::s_name, ClientSocket::sc_version, item_struct::type, update_item_sort(), and item_struct::weight. Definition at line 596 of file item.c. References csocket, item_struct::env, ClientSocket::fd, item_struct::locked, MAX_BUF, script_monitor_str(), SockList_AddChar(), SockList_AddInt(), SockList_AddString(), SockList_Init(), SockList_Send(), and item_struct::tag. Definition at line 645 of file item.c. References item_struct::anim_speed, item_struct::animation_id, copy_name, create_new_item(), item_struct::d_name, item_struct::env, item_struct::face, get_flags(), item_struct::inv, item_struct::inv_updated, locate_item(), item_struct::nrof, remove_item(), set_item_values(), item_struct::tag, and item_struct::weight. Referenced by common_item_command(), and UpdateItemCmd(). Definition at line 91 of file item.c. References item_struct::applied, item_struct::env, insert_item_before_item(), item_struct::inv, item_struct::locked, item_struct::next, item_struct::prev, item_struct::s_name, and item_struct::type. Definition at line 473 of file item.c. Definition at line 27 of file item.c. Referenced by create_new_item(), and remove_item(). Definition at line 28 of file item.c. Referenced by AccountPlayersCmd(), locate_item(), and map_item().